FOR most field members, the first hunt day is a beginning. But to the Masters and hunt staff it is, in many ways, a grand finale. If you take a sort of “journey to the center of the earth” look at what has occurred behind the scenes to make this day possible, you’ll see what I mean. Case in point: our grand hound Iroquois Grundy ’98 died several years ago, but he had a tremendous impact on the Oct. 3 opening hunt. A great hunt can only become great if it has a great hound breeder behind it. Grundy is an excellent example of this. So much thought, care, and consultation go into mating hounds in order to produce the kind of hunters that can give outstanding sport. Iroquois makes its mating choices with special care, because we breeed relatively few hounds and have committed to keep them all from cradle to grave. 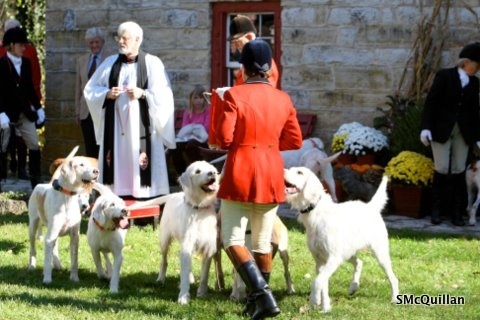 For any hunt, Iroquois definitely included, the idea is to breed hounds that are great hunters themselves but who will also keep providing great sport through future generations. That is what Grundy, who was bred by North Cotswold huntsman Nigel Peel out of the Peterborough champion Grapefruit, has done for Iroquois: give great sport himself, then through his sons and daughters. When breeding hounds, you pick what you want to add to the pack by looking at its breeding and considering what it will contribute once it is an experienced hound. For instance, we don’t expect anything from Paper this year, but his breeding suggests that, down the road, he should be a great cold-nosed hound that could be invaluable on bad scenting days. We had a lot of trouble with splits until Grundy, whom we imported from the North Cotswold in England, showed in his second season to be a non-switcher. In other words, he always stayed on the line of the original hunted coyote. So we, along with many other hunts, used him as a stallion hound. Thankfully, he passed that trait along to his offspring. Ten of the hounds that hunted on opening day Oct. 3 are Grundy’s blood, and they reflected his immense contribution to our pack. Rarely nowadays do we have splits. With much anticipation, 40 field members and staff met at Brookfield Farm for the first cub-hunting morning. 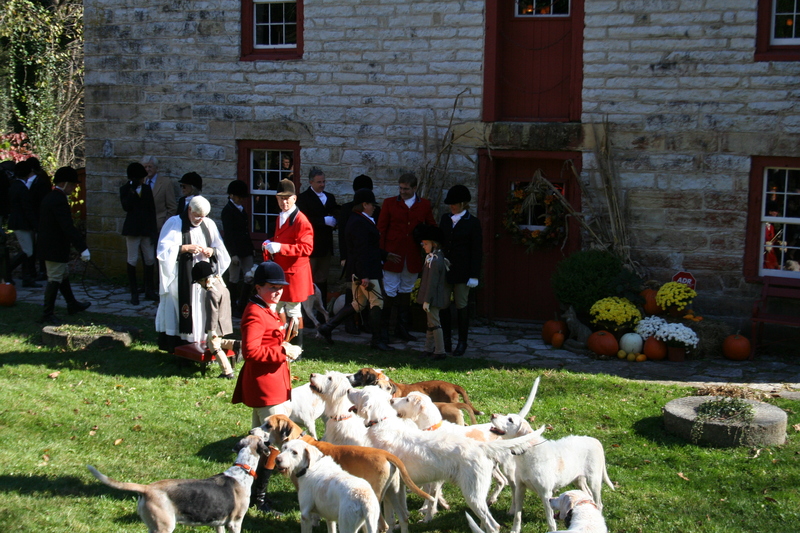 The hounds we had out Oct. 3 were Finite, Finesse, Sassoon, Savvy, Salute, Saracen, Saba, Allie, Grindstone, Sayso, Latch, Flash, Sage, Stanway, Griffin, Stam, and Glog. Like the first day of school, there was nervous excitement in the air. It was a bright sunny morning with a temperature of about 45 degrees. There had been a full moon and clear skies the night before. I had woken up several times in the night supposing that all nocturnal animals would be busy hunting, and by morning would be tucked away to rest somewhere. We have not seen much game on houndwalks, not like in previous years. Common sense tells me they must still be out there, we just can’t see them, although only two landowners said they had seen a coyote this summer. I opened my bedroom window to see if by chance I could hear that familiar coyote laughter, but the night was quiet. Each season, the hunt country poses new and different challenges and limitations. Some land gets closed off by development, some coverts get leveled for farming, and some years there is drought. This year, there is thick vegetation from the unusually wet summer. It’s going to be hard to see the hounds in the coverts as they draw–and even harder to see game. At the landowners’ request, the first draw of the morning on Oct. 3 would be a large corn field in a corner bordered by two busy roads. Consequently, we carefully chose hounds for the day who were experienced in the dangers of traffic. They also were ones the hunt staff could stop if they ran something that would cross those roads, leading them into danger. As always, the hunt staff and Masters’ primary concerns are respect for the landowners and the safety of the hounds and field members. Sometimes on houndwalk, hounds will drift ahead of me, and, just to school them, I’ll call them back. But Finite and Finesse will not volunteer to come back. Instead, they’ll stand still as though they don’t want to cross the same ground twice. They know I’m going to walk forward to where they are, so why come back? Geeeeeeeeez. But not on opening hunt day! Once I blew the horn and left meet, there were the girls out front, tails wagging, purposefully moving forward, on a mission and focused. I had to use my voice to steady them, and they responded without looking back at me – obedient but lost in concentration. The girls were switched on! "Two bodies, one brain": Finesse and Finite are two sisters by Grundy. They did him proud at the Oct. 3 opening meet! We held the hounds up as the field of 30-plus riders moved around the sides of the corn bordered by roads. 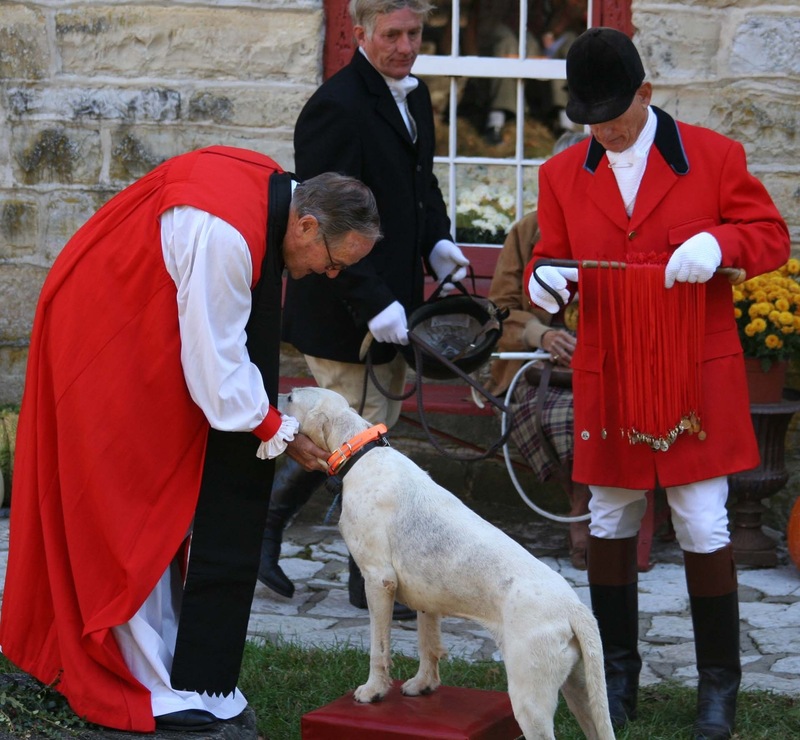 The hounds respected the hunt staff and impatiently waited as all the riders got in place. I can’t tell you how proud we all were of them–all the summer training pays off. It is little things like this, being able to hold the hounds up until all is ready for them to go in a covert, that are such great rewards. Then being able to take them towards it, but requiring them to go in exactly where the huntsman wants instead of just rushing forward. Those subtleties that put such polish on a pack also reflect great whips. It makes you very proud, but you also smile as you remember all the mistakes hounds have made along the way and how much guidance and training they needed to reach this pinnacle. Hounds spilled into the corn, drawing well considering there was no way to ride through the corn, and so I had to just stay outside. They spoke some, a good start. We left there and drew more coverts to the south: Davenport’s, Wee Young’s, Raymond’s Scrub. It was pleasing to see such beautiful houndwork; they were very thorough in underbrush so thick you could only hear them moving through and only occasionally see the tips of their wagging tails. But I was getting anxious to find game. Next we hacked to two smaller corn fields in Little Kansas. The first was very long, but only about 15 rows wide. I wanted to draw west to east. Hounds went in, and halfway down the field, most spilled out, moving towards the bigger corn to the north. Early in the season, you really want hounds to stay in the covert they are drawing unless they find game or are called out by the huntsman. If half the hounds are in one covert and half have drifted to the next, and then suddenly one group fires off after a coyote, the rest will be left behind. That’s especially detrimental to the puppies. So I called to the hounds that had left the covert, turned my horse towards the little corn, and lieued them back in. It was risky to try to do without a whip there to reinforce my command, but the intensive summer training stood hounds in good stead again. It occurred to me they might have been winding something in the bigger corn, but cub-hunting is as much about hound training as hunting, and I want the hounds to be disciplined in coverts. As soon as they got into the bigger corn, they erupted in full cry. Fieldmembers were spread out on the west end as a way to discourage game from going across that fenceline out of the hunt country. Round and round the hounds went. A whip tally-hoed a coyote out of the corn south. But hounds did not follow, indicating to me there were multiple coyotes in there, and the one the whip saw just got flushed out. One of the hardest things about hunting coyotes is the fact that they often travel in groups, so if you find one you actually might have found four or five together. Most of the time, they will each run a different direction, seemingly to deliberately split the pack of hounds. It is a real muddle if three couple of hounds are running east another five couple running south, and the rest running north all after coyotes. This happened a lot in the early 1990s when coyotes first established themselves in our hunt country. The correct way to handle that scenario is that the huntsman must choose which hounds to follow, blow the horn and hark hounds out of the covert. Any hounds following another coyote are a split: the whips must stop them and send them on to the huntsman with the main pack. This is very difficult to do, as a whip only has a few seconds to stop hounds and divert their attention back to the horn. Once hounds have gotten half a field away on a coyote, it’s almost impossible to turn them back, and by then the huntsman and sound of the horn is long gone. Grundy died several years ago but is memorialized by this life-sized bronze at Miller Trust. It shows him doing what he was made to do: chase coyote without switching! Hounds were still full cry in the corn, and another coyote was viewed going south out of the covert. A few minutes later, a third very small coyote came barreling out the east end, followed closely by “two bodies one brain”–Finite and Finesse–with the rest of the pack in hot pursuit. I said under my breath, “Thank you, Grundy!” The coyote slipped through a wire fence too tightly woven for the hounds to penetrate. I galloped forward and opened two gates to let hounds through, they cast themselves east to no avail, then returned to the fenceline where they last smelled the quarry, as they often do when they make a lose. I cast them into the bean field that was on the other side of the fence. Finite erupted again, running hard north. Hounds honored her, and the little coyote was viewed again. It ran through another tight fenceline and turned west, only to be turned back into the beans by fieldmembers going in early. Hounds were delayed getting through the fence and made a lose. The Masters had seen the coyote get turned and go back into the beans. But it’s amazing how coyotes seem to just vanish when they lie down and hide! The beans were not that tall, but he had disappeared into thin air. I took the hounds and began making a half moon cast in the field. Long minutes went by, hounds were tying but could only find a very angry skunk! I noticed Finite, Finesse, and Grindstone trotting off to the north end of the field, though most of the hounds were in the center. The hounds spoke, and tally ho! The coyote was viewed going east out of the north end of the beans. He ran several fields through cattle, and the hounds eventually lost the scent. It was getting hot so we called it a day. And what a day to begin with! Grundy would have been proud of his pups, and his spirit shone in them through their honesty as a pack. One other note of honor: the award for Last Field Member Out. This one goes to Cheri Clark, who graciously led Master Jerry Miller’s horse back to the meet, as he prefers to dismount wherever hounds are loaded–and it was a long hack back to the meet!